Our top five Pantone facts that will help you to choose the Pantone Guide that's right for your project, and may even save you money! Pantone graphics guides, like the Pantone Formula Guide or the Pantone Color Bridge, are produced by actually printing the ink colour sample on to the paper lithographically and should be used when a project is to be printed. Pantone Fashion, Home + Interiors Guides are made by coating the colour sample on to paper and should be used when referencing colour for the production of textiles, paints and hard or soft goods. Pantone solid or spot colours, as found in the Pantone Formula Guide, are created without the use of screens, half-tones or dots. Pantone CMYK Guides reproduce four-colour process colours with varying combinations of cyan, magenta, yellow and black inks. The Pantone Color Bridge shows both the Pantone solid colour alongside it's closest CMYK representation. A Pantone Lighting Indicator Tool can be found at the back of most Pantone graphics guides. If the two colour patches match, then your studio ambient lighting is good for accurately evaluating colour. If they don't match, then you need to view your colours under better lighting conditions. Pantone Lighting Indicator Stickers are also available for attaching to your proofs to ensure sound colour evaluation by everyone in the production chain. 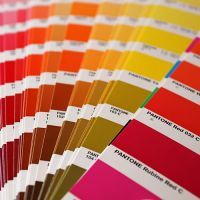 We recommend replacing your Pantone Guides every 12 to 18 months, since regular handing, paper ageing and exposure to light and moisture can cause the guides to fade and lose colour accuracy. Pantone Solid Chips are not only ideal for specifying colours in design files, but can also be used to add colour into design palettes, mood boards and product illustrations. They are also useful when approving colours in manufacture or on-press.